<--- Clicking on the "Donate" button allows you to to use Paypal to make payments to Jazzical Music. These payments help support the work we are doing that is described below. Thank You! A dear friend of mine passed away in May of 2013. He was an amazing guitarist, songwriter, arranger, and artist. I was with him in a band that was really going places. We did not have the chance to record a vast majority of his songs that the band learned because it was not written in a form that allowed it to be reproduced. Unfortunately, my friend's music died with him. That realization shook me to my core! The motivation to offer the music on this website is to not only share it, but to also preserve the music I have composed for over 45 years for future generations. Many hundreds of pages, from original manuscripts to finished printed scores and parts, have been cataloged, scanned, printed, and recorded to date. Many more hundreds of pages are still to be done. The process of preserving the music is complex and very time-consuming. To simply say that it takes money to keep this website open and available to everyone does not explain the reasons why that is. In an effort to reach as many people as I can, I have asked for the help of two extraordinary young women: Erin Call and Keely Southwick. The two are members with me in a performance group we formed in 2012 called Vim Natura. We only performed together once... things like education and having children have gotten in the way. Occasionally I have grabbed one of them to perform with me at an odd gig now and then. Up until now, both Keely and Erin have graciously given of their time to help me. I am asking for donations so that I can pay them for their continued support. Computer technology now allows composers of all kinds the ability to record, print, and publish their works, but aside from posting on the Internet there are very few truly integrated tools to effectively archive the creative process. The three of us at Jazzical Music intend to blaze a few trails. We propose to create a system that will allow composers like me (the last generation to use old pre-computer methods) to preserve their music. With the emphasis on recorded music and the decline of musicians who can actually read music, this work has become vitally important. 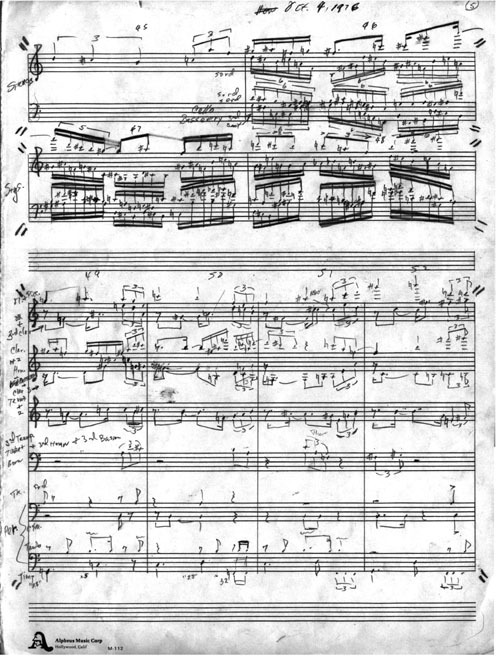 Much of my music, like that of most pre-computer composers, was originally written by hand with pencil on manuscript paper. Then it was copied with ink on vellum paper (for large pieces) and/or manuscript paper when xerox-type copying machines became available. 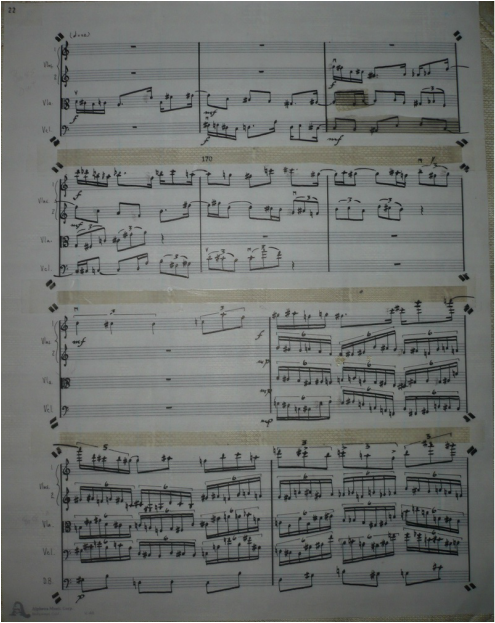 The manuscript shown above is a section of my second symphony "Dhyan". As you can see, this section was hand-written and composed on October 4, 1976. The next step, shown above, was to laboriously copy the manuscript by hand (again) onto an opaque vellum sheet. This was done later in 1976. The printing process was similar to blueprints for construction, but was called "blackprint" (or "blackline") because it produced black and white prints more suitable for music scores. Nearly thirty years later, some time around 2002, I was able to input the score (again by hand) into a computer music notation program called "Mosaic" by Mark of the Unicorn. The print out (done on a laser printer) was then scanned as a pdf file that is available for download on this website. Unfortunately, "Mosaic" has been obsolete since the early 2000's. There is no way to easily convert files created by "Mosaic" to any other modern music notation program. Many years ago I stopped composing with pencil and paper. However, I have many pieces trapped in software that cannot be printed anymore because equipment to run old notation programs is no longer available or newer systems are not backwardly compatible. Although computer program formats like MIDI and XML help a little, there is to date no easy way to convert older format music notation programs so they can be edited and used by modern notation software. There is no reliable way to convert hand-written music into a computer notation program. So, composers must input music note-for-note by hand into any notation program (playing through a MIDI keyboard instead is a cruel joke). The effort is most times worthwhile because notation programs can print out parts and scores in many formats (so you don't have to do those over by hand as well), and even play the music fairly convincingly. That said, practically the only reason to undertake the enormous task of inputting an old piece of music from manuscript or obsolete program into a modern notation program is so that a decent electronic version of it might be recordable. Much of my music is a bit on the "complex" side. It is virtually impossible to get anyone to play it properly without great effort and expense. Getting an orchestra or other large ensemble to play new music is a monumental task. Between a decline in the number of of symphony orchestras, the gutting of string programs in most schools in the United States, and the fact that many people cannot read music, things look pretty bleak. Add to that the fact that you simply cannot go to a music store any more to look through printed music you might like to try for your string quartet, and things look downright scary for composers. Because so much of the way people experience music is by listening to it instead of reading to play it, I feel compelled to record my music - even if those recordings are a computerized rendering. We thank you for any financial donation you make through PayPal. There are all kinds of ways to help, other than with financial capital. A very good discussion of ways people can help with projects like ours can be found at the Apple Seed Permaculture website. For now, we are very interested in your ideas, suggestions, tips, and connections to others who have given some thought to these problems. Although my emphasis is on printing music, we could use your help to perform my music so that good quality recordings can be offered as downloads. At some point I intend to sell recordings on subscription services such as iTunes, and would be very happy to partner with performers to produce those recordings. You might like to donate some time to help create the network of cooperatives I mentioned above. Perhaps you are interested in helping to develop software. We are open to all ideas and encourage you to visit the Jazzical Music Blog to post your thoughts. 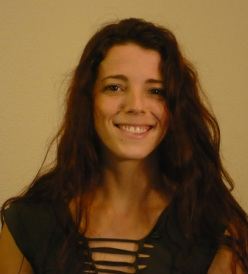 Erin Call was born and raised in the Sierra Nevada’s/Clovis area. She moved to Lake County when she was 8 and has lived here ever since with her mother, father, brother and sister. When she turned 9, she started playing violin and clarinet simultaneously and began to perform with various local groups. She started singing at 12 years old in the school choir. She also joined the Lake County Orchestra while in High School. When she graduated High School, she continued on to Mendocino College and performed in the Masterworks Chorale, Symphonic Band, and Ukiah Symphony. She worked towards a degree in Recording Engineering and Performance. She is now studying Nursing at Mendocino College. Keely Southwick is a native of Willits, CA, Keely began her singing career early, when she was asked to sing as a child at her church. Clovice "discovered" her in 2003, when they both performed at an annual Christmas concert for the Church of Latter Day Saints held in Lakeport, CA. Since then, they have been performing together. 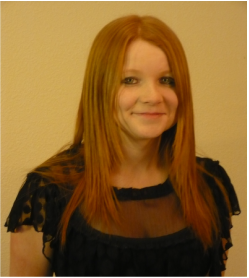 Keely graduated from Willits High School in 2005 and began a career as a vocalist. Keely is the mother of two young boys - Levi and Elijah.